Keeping employees on time will help many businesses stay organized. Managers will want to check out how they can actually keep tabs on how many hours their employees log throughout the week. This is vitally important if businesses want to make sure that their labor expenses don’t get prohibitively expensive along the way. It will also be important for anyone who wants to track down the different overtime hours that employees tend to log. All of this information will be important for owners who want to accurately estimate the true operational costs that they are facing throughout the day. This will make them much more prepared to cope with certain challenges along the way. The operations employee timecard has been developed to help owners collect and categorize information on the hours generated by their employees. The document is actually fairly straightforward, since it will offer people the opportunity that they need when it comes time to book different expenses. The document can be downloaded by just about anyone, since it is freely available online. Some people may want to check in to how they can actually customize the document as well, since it can be easily edited by just about anyone. This will help owners who may need to change up the document from time to time so that it will suit their needs. 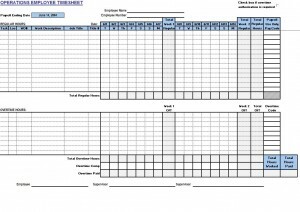 When owners check out the operations employee timecard, there are a few unique features that they will want to notice. Some of them will naturally want to streamline the document to make sure that it works with the needs of their business. Other owners will want to check in to how they can replicate the document and pass it out to everyone that is working in the office. The can even show staff members how they should enter the information on their own individual operations employee timecard. Ideally, the operations employee timecard will go a long way towards helping owners organize this information. They should check to make sure that they are getting accurate information as well.